Blueberry pancakes without eggs makes very easy and delicious pancakes for breakfast or snack. 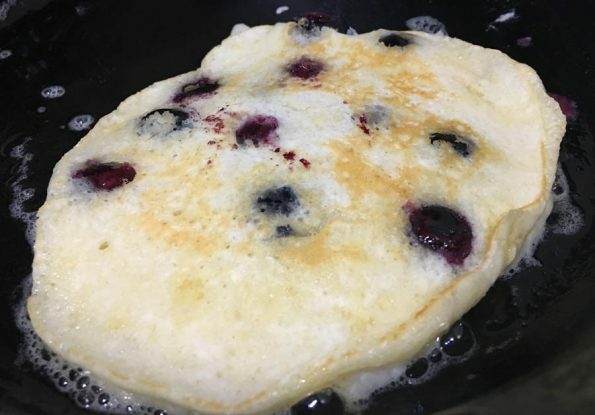 This egg free blueberry pancake recipe uses whole milk in the preparation of the batter and make sure to use good quality all purpose flour to make the best blueberry pancakes without eggs. 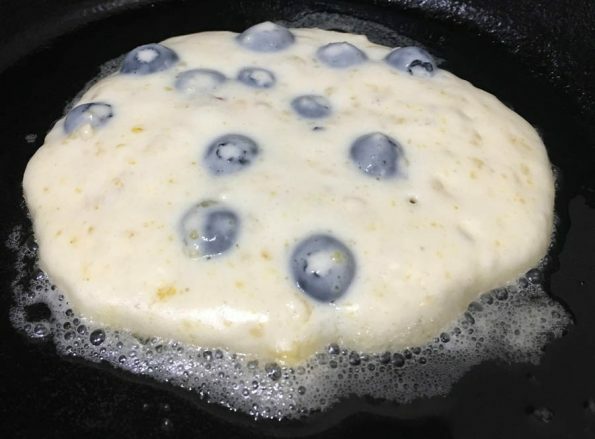 Since we are adding fresh blueberries, it is better to use all purpose flour as the texture of the flour is very important in holding up the egg free pancakes that also contains blueberries. I used this unbleached all purpose flour to make these eggless blueberry pancakes. You can make the pancakes using an iron pan or iron skillet or a regular non stick pan or you can use a pancake pan or pancake grill griddle pan if you want to make multiple pancakes together which will help to save you much time. I adapted the eggless blueberry pancake recipe from here, and slightly modified the recipe to add more blueberries and also vanilla flavor, and the pancakes turned out very delicious. I was initially not very sure about trying eggless pancakes with blueberries, as I thought it would be quite difficult to make these without using eggs. I have delicious eggless pancakes before, like this egg free pancakes using yogurt and egg free pancakes using flax seeds. However, I was not sure if the pancake batter with blueberries will hold up well without using eggs. And I was amazed to see how they turned out to be so easy to prepare and so delicious too! So do try the eggless blueberry pancakes if you have fresh blueberries at home and if you are out of eggs. 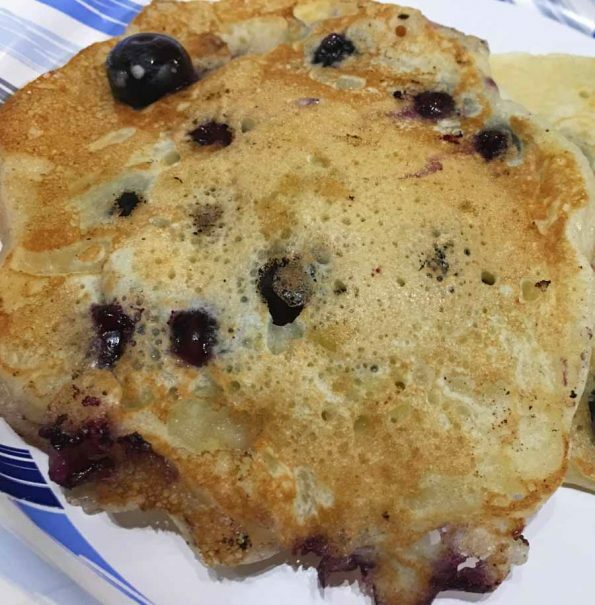 While flipping the pancakes, even if one or two blueberries fallout its perfectly fine, you can just add them back in place once the pancakes are cooked. In this recipe for blueberry pancakes without eggs, I mixed in the fresh blueberries with the batter and then made the pancakes. Instead, you may also do it this way – pour the pancake batter to the pan, and then top with the blueberries as you wish, and then cook as usual. I went with the first method of mixing the blueberries with the batter, since I wanted to make them so quickly. So here is how you can make these blueberry pancakes without eggs following this easy eggless blueberry pancake recipe. Blueberry pancakes without eggs is easy to make and delicious too. Wash the blueberries and transfer to a bowl. Add one tablespoon of sugar to the blueberries, mix well and keep aside. In another large bowl, mix together the dry ingredients - flour, baking powder and salt. In a small bowl, mix well the melted butter, and the remaining one tablespoon of sugar. Add the milk and vanilla extract to the butter sugar mixture and mix well. Transfer the butter sugar milk mixture to the dry flour mixture and mix well without any lumps. Add the sugared blueberries to the flour mixture and mix the batter gently. Now the blueberry pancake batter is ready. Heat a nonstick pan or iron pan or skillet, or a pancake pan, grease with butter. Pour a small ladle of pancake batter to the pan, keep the heat in medium to low adjusting as needed. Wait for a coupe of minutes so the pancakes will get cooked on the bottom side and holes will appear on top of the pancakes. Gently flip the pancake and cook for another minute so the other side too will get cooked. As I mentioned earlier, even if one or two blueberries fall out of the pancake while flipping, it is totally fine as you can just fix them back once the pancake is completely cooked. Gently transfer the cooked pancake to the serving dish or container and cook all the pancakes the same way until all the batter is finished. Serve the delicious eggless blueberry pancakes with butter or maple syrup or any topping (like fresh blueberries) as you wish. Hope you found this post on blueberry pancakes without eggs helpful in making easy and yummy egg free blueberry pancakes from scratch.